The Goldsmiths’ Fair stand at Collect 2019, the International Art Fair for Contemporary Objects, was a great success for our exhibitors and the Company this year. 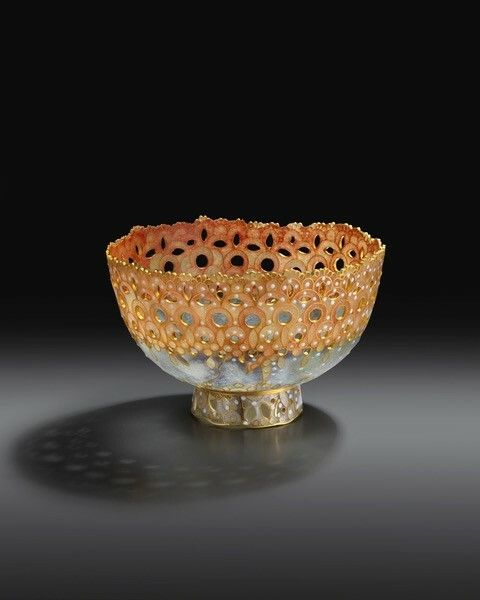 We made some exciting sales, not least one of Alexandra Raphael’s newest pieces, the Lace Bowl, an extraordinary feat of the plique-à-jour technique that she has been perfecting throughout her career. The piece was sold to a group of curators from the Victoria & Albert (V&A) Museum. We are thrilled that this fantastic piece will be entering the collection of the V&A. 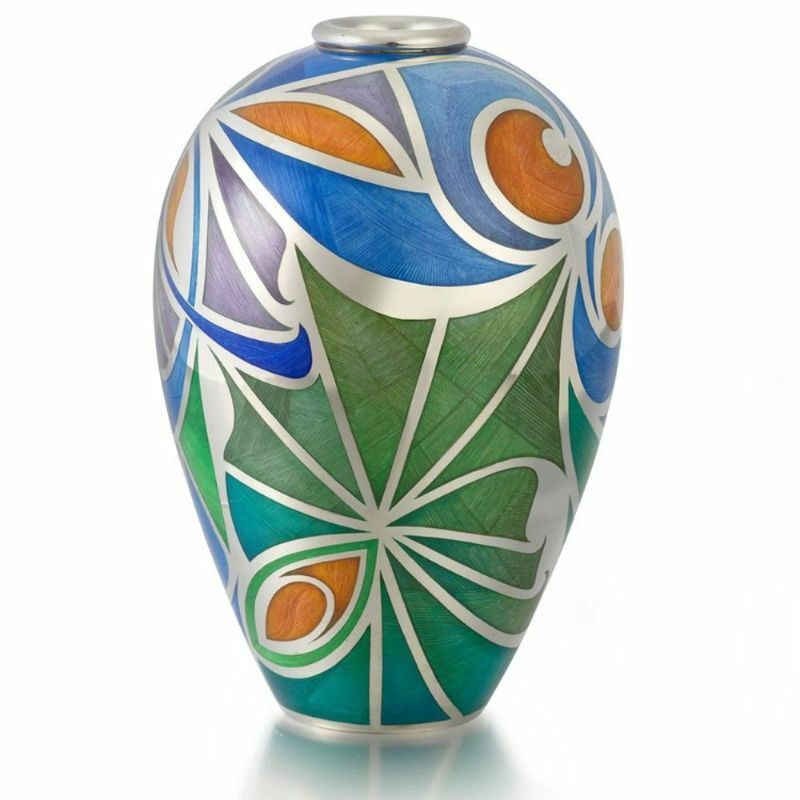 We are delighted to announce our latest acquisition: an exquisite enamelled silver vase, Abstract Design No. 1, by Phil Barnes, mentor and tutor in the art of champlevé enamelling. The design has been drawn directly onto the piece, then engraved and keyed for the translucent enamel, which required up to 15 firings. 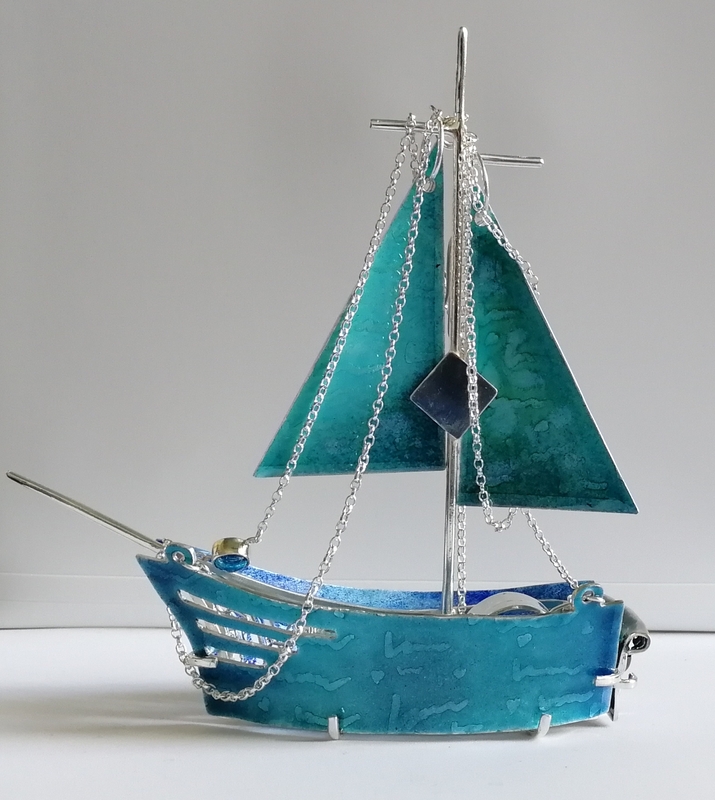 The Guild of Enamellers is delighted to announce Valentina Boneva as the 2019 winner of their annual Bursary Award. Valentina recently completed the HND Jewellery at Glasgow Kelvin College, Glasgow. Valentina started working with enamels this year as a means to add colour to her work and to complement the use of gemstones in pieces. Valentina’s innovative selection pieces were complex and transformable pieces comprising an etched and enamelled boat “stand” that deconstructed into earrings, necklaces and a ring. 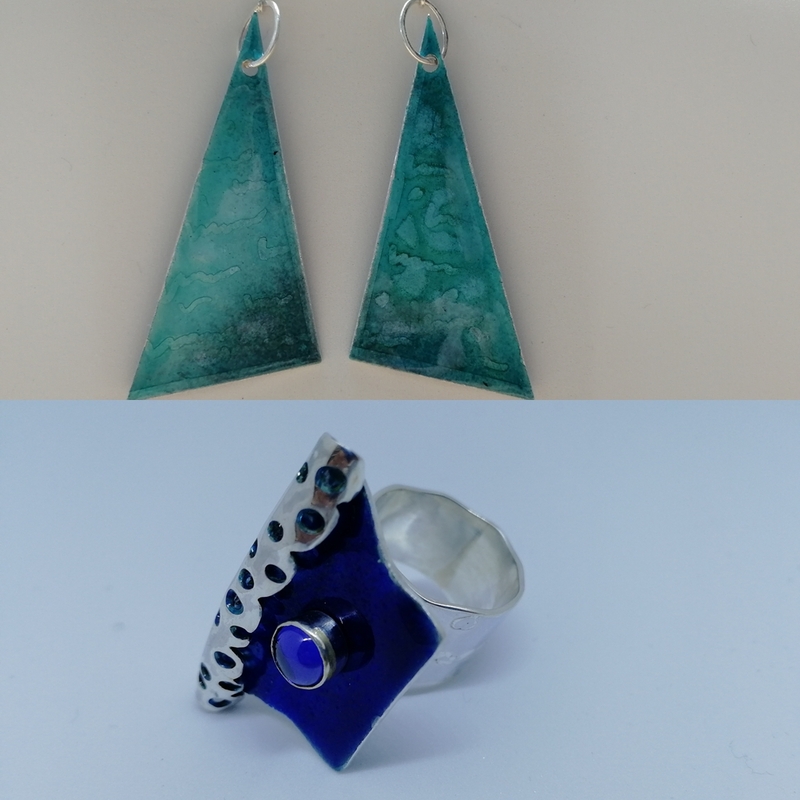 Valentina is passionate about enamelling and wants to incorporate it into her future jewellery and silversmithing projects where it will complement traditional techniques such as etching, stone setting and fold forming. 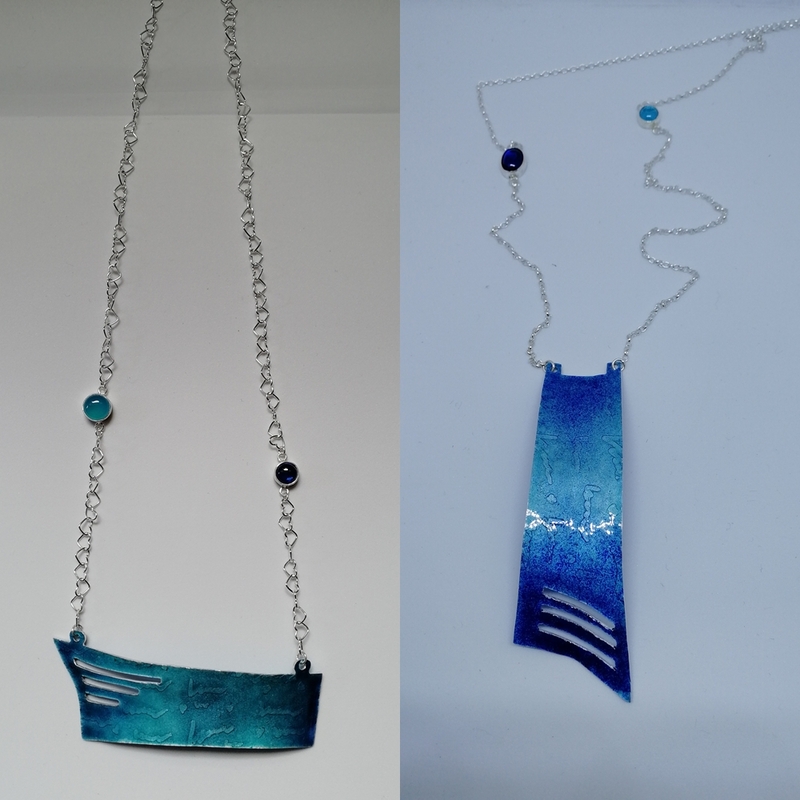 The Bursary Award package will allow Valentina, who is Edinburgh based, to experiment further with other techniques and to expand her enamelling knowledge. Sponsorship will allow Valentina to benefit from conference, workshop and masterclass attendance, printed and online resources, Guild teaching DVDs, enamel tools, equipment and supplies vouchers, enamel sample sets and one year’s membership of both the Guild of Enamellers and the British Society of Enamellers. The Guild is extremely grateful to joint sponsors The British Society of Enamellers, W G Ball Ltd, Proops Brothers Ltd, Milton Bridge Ceramic Colours and Vitrum Signum for supporting the Bursary Award. Thanks to the generosity of our sponsors, Sarah Christian, Estelle Burton, Signe Sternum and Debbie King were awarded runner-up prizes. The prize packages will encourage Valentina and the runners-up to further develop their enamelling skills and exploration of the medium within the supportive networks offered. The selection panel was impressed by the quality and diversity of the submissions, and were heartened to see the use of traditional techniques such as cloisonné, pliqué-à-jour and champlevé along with more contemporary approaches to enamelling. It was clear that the applicants had a real enthusiasm, passion and flare for enamelling. Both the Guild of Enamellers and the British Society of Enamellers will offer support and networking opportunities to all the applicants as they pursue their enamelling journey. Bursary application information for the 2020 Award will be available online (www.guildofenamellers.org) from April 2019. Harrison & Harrison is the UK's largest supplier of base metal shapes for crafts. We would love to welcome all new customers with a 25% discount on your first order. Here at W.G Ball we would like to offer all members of the Guild of Enamellers a 10% discount on all Jewellery enamels, Wet Process enamels and leadfree painting colours. In the past we have offered discount to members on an ad hoc basis but we will now offer a constant, year round discount. When you get to the checkout point on our website you will notice that there is an area where you can input a coupon code, if members of the Guild input the code "guild", the discount will automatically be deducted.